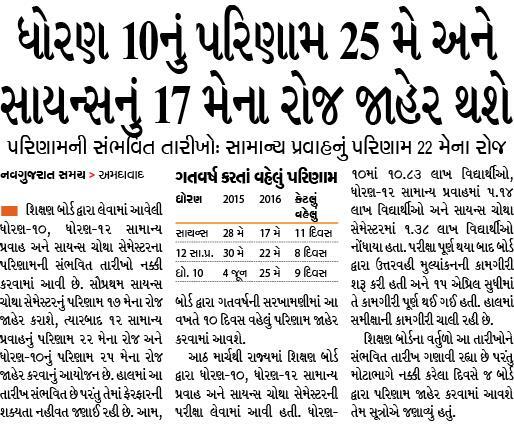 GSEB SSC, HSC, HSC Science Result 2016 Date www.gseb.org Related News गुजरात शिक्षण बोर्ड द्वारा लेवामा आवेली STD-10, STD-12 General and STD-12 Science Sem 4 Result नी संभवित तारीखों नक्की करवामा आवी छे. सौ प्रथम HSC Science Sem 4 Result 2016 17 May ना रोज जाहेर कराशे, त्यारबाद GSEB HSC Result 2016 22 May ना रोज अने GSEB SSC Result 2016 25 May ना रोज जाहेर करवानु आयोजन छे. हालमा आ तारीख संभवित तारीख छे परंतु तेमा फेरफारनी शक्यता नहीवत जनाइ रही छे. आम बोर्ड द्वारा गतवर्शनी सरखामनीमा आ वखते दस दिवस वहेलु परिणाम जाहेर करवामा आवशे. 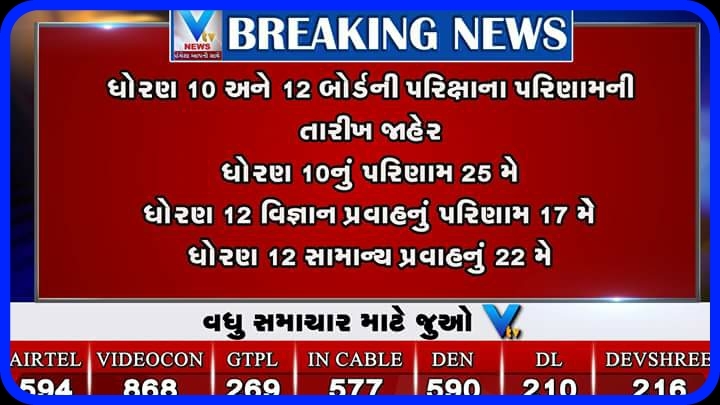 गुजरात बोर्ड द्वारा मार्च महिनामा 10th Class, 12th Class and 12th Science नी परीक्षा लेवामा आवी हती. धोरण-१० मा १०.८३ लाख विद्यार्थियो, धोरण-१२ सामान्य प्रवाहमा ५.१४ लाख विद्यार्थियो अने १२ सायन्स मा १.८३ लाख विद्यार्थियो नोंधाया हता. परीक्षा पूर्ण थया बाद बोर्ड द्वारा जवाबवही मूल्यांकननी कामगिरी शरु करी हती अने १५ एप्रिल सुधिमा टे कामगिरी पूर्ण थाई गई हती. हालमा समिक्षानी कामगिरी चाली रही छे. शिक्षण बोर्डना वर्तुलो आ तारीखने संभवित तारीख गनावी रह्य छे परंतु मोटाभागे नक्की करेला दिवसे ज बोर्ड द्वारा GSEB.org Result 2016 जाहेर करवामा आवशे तेम सूत्रोंऐ जनाव्यु हतु. Gujarat : GSEB Exam Results 2016 for SSC, HSC and HSC Science Semester 4 Examination has been declared on Last week of May. A huge number of students who appeared in the exams, can access the Gujarat Board Result 2016 Soon at gseb.org, the board’s website. The Gujarat Secondary and Higher Secondary Education Board or GSEB is a government of Gujarat body responsible for determining the policy-related, administrative, cognitive, and intellectual direction the state’s higher educational system takes. he Gujarat board was formed on 1 May 1960. It is very popular board in the Gujarat State. It is conduct all school level exam. The main academic task of GSEB is the preparation of syllabus for secondary schools and also the recommendation of text-books to be taught in government schools. The Board also performs the duties of recognising new schools, performance evaluation of schools and inspections of various schools associated with the Board. Click On GSEB Exam Result 2016.